Travi-Electrolyte 600gr by Travipharma is a mixture of Electrolytes enriched with dextrose, ideal mix for pigeons and cage birds. 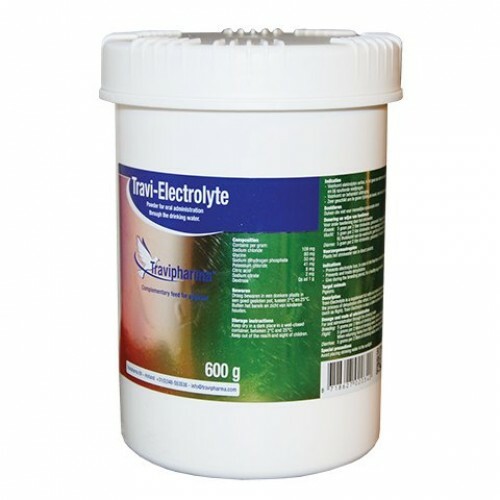 Travi-Electrolyte is a supplement filled with electrolytes and enriched with dextrose. Prevents dehydration after exertion. - Prevents the loss of electrolytes, in case of paratyphoid, coccidiosis or severe diarrhea. - Prevents and treats dehydration. - In reproduction time: 5 grams per 2 liters of drinking water, for 2 days a week. - For races: 5 grams per 2 liters of drinking water, the day before and when returning home. - Treatment for diarrhea: 5 grams per 2 liters of drinking water, for 3-4 days a week.